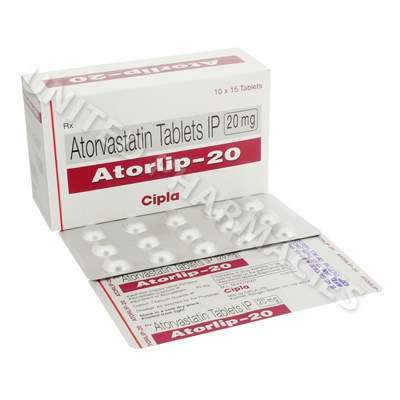 Atorlip (Atorvastatin Calcium) tablets are used to treat various forms of dyslipidemia (abnormal fat levels occurring in the blood) and prevent patients with diabetes, coronary heart disease (or other medical conditions that place them at risk) from getting cardiovascular disease. Atorlip (Atorvastatin Calcium) tablets are used to treat various forms of dyslipidemia (abnormal fat levels occurring in the blood) and prevent patients with diabetes, coronary heart disease (or other medical conditions that place them at risk) from getting cardiovascular disease. Drug treatment is generally only considered after lifestyle changes such as regular exercise, consumption of a low fat diet and weigh loss have not been successful in causing a satisfactory reduction in cholesterol levels. This medicine is known as a HMG-CoA reductase inhibitor, however, it is most commonly referred to as a statin. It acts in the liver, and blocks the production of cholesterol, which is achieved by inhibiting the action of HMG-CoA reductase (a type of enzyme that causes cholesterol production). Reducing cholesterol production also results in lower cholesterol levels in the blood. Atorlip (Atorvastatin Calcium) is administered in strict accordance with the dosage regimen planned for you by the doctor providing medical treatment. Adults are often informed that one dose per day is required, however, the exact strength can vary, depending on numerous factors. These tablets contain 20mg of the active component. Usually, the dosage range is 10mg to 80mg per day. It is important to note that the initial dosage, as well as the maintenance dosage will be individualised by your doctor, based on your condition, response and how large a reduction in cholesterol is required. Patients who need a higher reduction may be told to start out with a stronger dosage. In all cases, concise instructions will be given by your doctor. Never adjust your dosage unless your doctor tells you to do so. Although relatively mild side effects are the most common, there is still the possibility of serious side effects occurring. This is less common. You must immediately seek medical attention if you experience hoarseness, a noticeable decrease in appetite, feeling severely tired, discoloured urine, weight gain or any other serious symptoms. Consumption of grapefruit juice or grapefruit must be avoided during treatment, as it may cause an increase in serum concentrations, which could be dangerous. Drinking beverages that contain alcohol may cause an increase in triglyceride levels, as well as putting the patient at risk of damage to the liver. Your doctor may tell you not to drink alcohol during treatment.